We in the choir all love being part of this friendly, vibrant group and travel from far and near to Glasgow’s West End every Thursday evening to immerse ourselves in a variety of the best choral music from across the centuries, from fine but lesser-known works, to great classics. 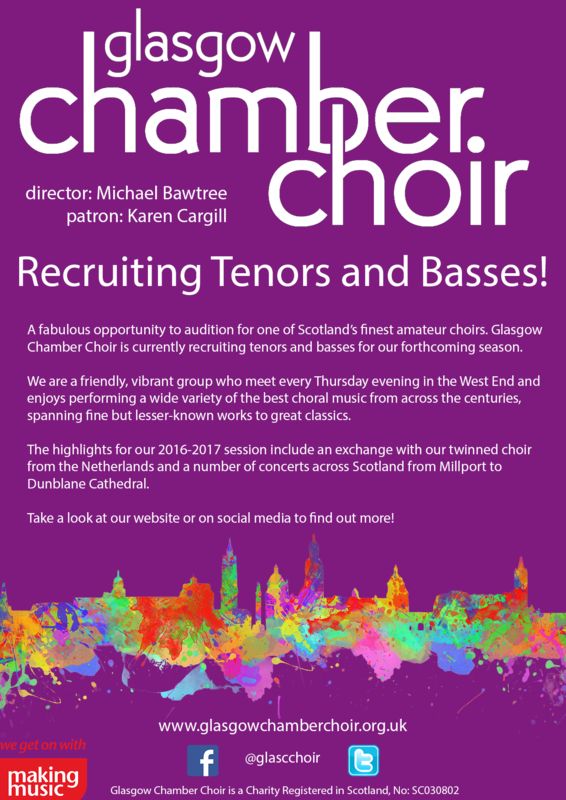 If you are interested in joining, please contact us, especially if you sing tenor or bass! You can see a flavour of some of the music we are performing this season in our 2017/2018 programme and also from our previous concerts to see what we’ve performed recently. We will consider your application, add your details to our membership waiting list, and may invite you to come for an audition when a place becomes available.